There is nothing more magical and amazing than the experience of watching the joy on a young child’s face as they play on a hand crafted rocking horse. It can consume hours of time transporting them into their own imagination, and it doesn’t matter if they are a boy or girl. The remarkable gift of a carousel or rocking horse can be a special occasion all to its own, and something that truly can be treasured for generations to come. These wondrous wooden creatures are timeless in their creation, however some of the first in recorded history date back to the 17th century, possibly as early as 1605, when England’s King Charles I rode one created for him when he was just a young boy. This first known rocking horse can actually still be seen today. Before this time it is rumored that Socrates actually rode with his own children on wooden toy horses, but the style that we are familiar with wasn’t created until the 1800s. The Victorian style horse that rests on bow rockers is considered by many to be the safest design due to the width that the rockers themselves are created. With the width of these rockers the horse can have good resistance against being overturned. After the turn of the 19th century wooden items began to be made outside the cottage and in large factories. Everything from furniture to toy making was manufactured in volume to help satisfy demand. The wooden bunk beds you might have crafted yourself could be purchased from a factory that inexpensively produced them in bulk. 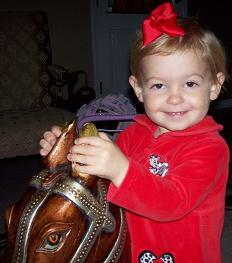 Now children from both sides of the continent could share in the special experience of a rocking horse. Queen Victoria once visited J.Collinson and Sons in 1851, and when she selected a toy rocking horse it was painted dapple grey it changed things for the small company. It was something that would alter how they produced their horses and after they moved their operations to the United States they only would create their horses in the Queen’s selected color. Although rocking horses became extremely popular all through out Great Britain, Germany and the United States, the First World War saw a major decline with the shortage that was seen of not just materials, but also craftsmen. Over the course of the last twenty years there has been a huge resurgence of wooden crafts. Not just are you seeing beautifully handcrafted vanities, cribs, desks, and bunk beds, but you are also seeing a new found passion for the traditional rocking horse. There are many patterns available and instructions that can assist you in crafting your own project, however there is nothing like the results of a woodworking master.